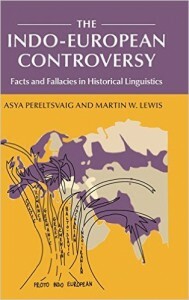 In writing about the fruit and vegetable exports of coastal Peru, I could not locate any on-line maps of the farming districts of the region. 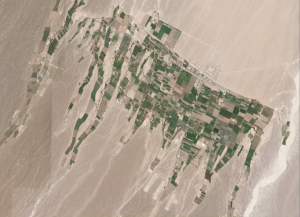 It is easy, however, to distinguish these areas in Google Earth, as the color contrasts between the lush, irrigated lands and their desert environs stand out, as do the rectilinear patterns of the cultivated fields. I have therefore constructed a rather crude map indicating the main areas of intensive farming in the strip of land sandwiched between the Pacific Ocean and the Andes Mountains and extending from Lima to the Chilean border. As can be gathered by comparing the finished map with the initial Google Earth image posted here, I first outlined the cropping areas on a satellite image and then transferred the patterns to a conventional map. I was originally intending to map the entire coastal zone of Peru, but the exercise proved rather laborious and other duties unfortunately called. As can be seen from the map, the main agricultural areas cluster in north Ica Region and in southeastern Arequipa. It is thus not surprising that many if not most articles on the produce-export business focus on the Ica Valley. 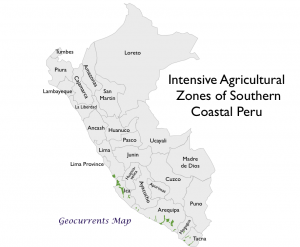 Most of south-coastal Peru’s farming districts, I was surprised to see, are at some distance from the ocean. 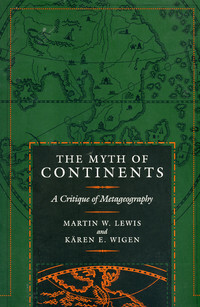 Many of the agricultural valleys are long and linear, and as a result extend well inland. 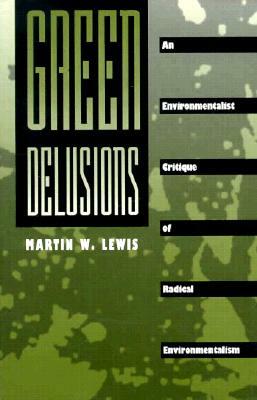 Intensive cropping is often clustered, moreover, near the base of the Andes, where water can be relatively abundant. 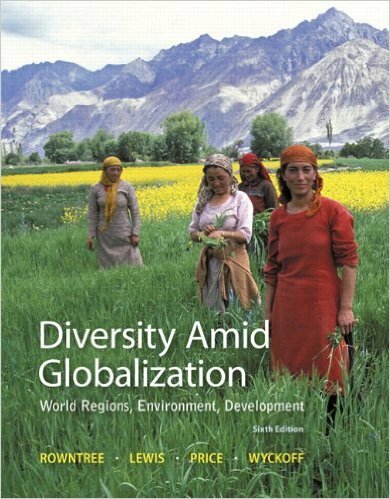 Not all of the areas mapped specialize in producing vegetables and fruits for foreign markets. 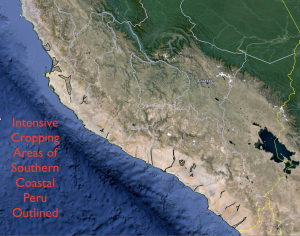 The valleys of coastal Peru have been intensively cultivated for millennia, producing a wide array of crops for subsistence and the domestic market. 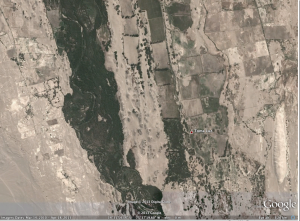 On Google Earth, however, it is often possible to distinguish new tracks of agricultural land, which we can assume are export-oriented, from the older farmlands. 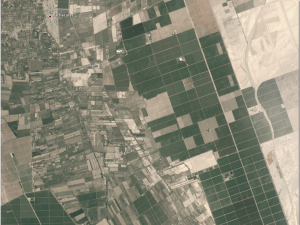 As can be seen in the image to the left, the newer fields are larger, more regular and compact in shape, and more intensively irrigated (at least during the season when this particular satellite image was captured). Such distinguishing characteristics are common across the coastal farming districts of southern Peru. In the older agricultural areas, the separation of cultivated lands from the surrounding desert is usually stark, making it relatively easy to map agricultural zones. 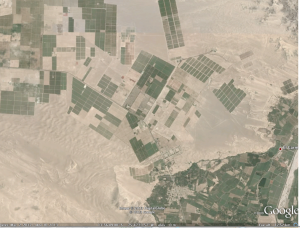 In some of the newer areas, on the other hand, rectangular patches of intensively cropped land are interspersed with patches of uncultivated desert, generating a cartographic challenge. In some of these places the areas brought under cultivation appear to be random, but in other they clearly follow the local topography (compare the two images posted to the left). As mentioned in the previous post, many of these new farmlands, and in particular those of the Ica Valley, are increasingly suffering from water shortages. Yet riparian forests are still found in some in some areas, as can be seen in the image to the left, which depicts a segment of the Ica Valley downstream from the main farming area. In the same slide one can see what may be abandoned fields; similar features are apparent along the margins many other cultivated corridors of coastal Peru. Nasca, is as it is called today, is a dry, why in time of the Incas was a formidable work of hydraulic engineering, water trayento Heights in underground branches, called aqueducts, which serve to present , to irrigate farmland and for home use.